Kennedy Spinal Decompression therapy - now offered at the Back Pain Institute of Colorado Springs - is the ONLY spinal decompression table on the market that allows patients to be treated in either the prone (face down) or supine (face up) position. Take a look at the pictures to the right and notice at all the positions the Kennedy spinal decompression table can create for the patient. This allows the treatment to be specific to the patients needs and create a more comfortable and effective experience. 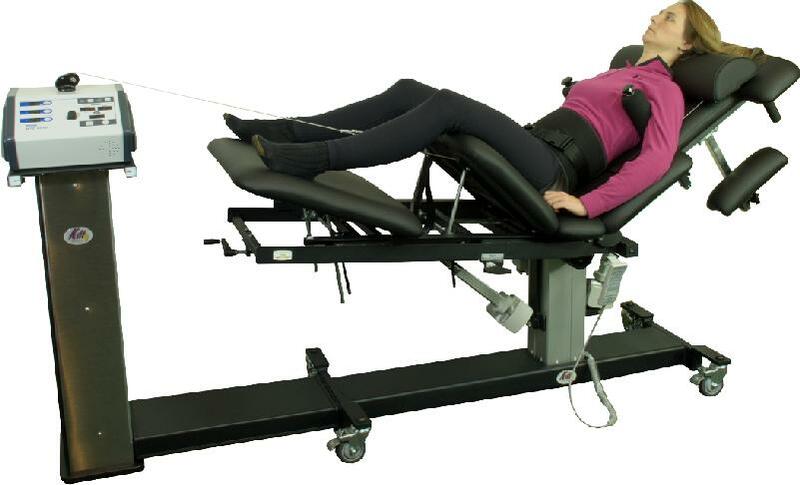 The Kennedy spinal decompression table can treat both the neck (cervical) and back, and it is completely customizable for any height or weight. It is such a comfortable experience that many people fall asleep during treatment. Spinal Decompression Therapy is a traction-based, FDA-cleared, nonsurgical treatment for neck, back and leg and/or arm pain. Based on research and clinical experience, the best results are achieved with 20 spinal decompression sessions over a six-week period, however, each patient is thoroughly examined and given an individualized care plans based on their needs and unique case. The effectiveness of spinal decompression is often increased when in conjunction with chiropractic, cold laser therapy, and muscular rehabilitation. There are quite a few studies regarding the effectiveness of spinal decompression and traction. In fact, we've include 50 published article abstracts for your review. Although none are Level 1 studies, one of the most well known studies on spinal decompression therapy was published in the Orthopedic Technology Review in 2003 by Gionis et al. Out of 219 patients, 86% who completed treatment reported immediate resolution of their symptoms, while 84% remained pain-free 90 days post-treatment. Physical examination findings showed improvement in 92% of the patients and remained intact in 89% of the patients 90 days after treatment. According to a recent study in the Journal of the American Medical Association (JAMA), spine surgery is no more effective than non-invasive treatments, including chiropractic care, for patients with lumbar disc herniation causing sciatica. Spinal decompression has saved thousands of people from the expense and risk of surgery and long-term prescription medication. We recently saw a patient who already had a spinal fusion surgery. Her bill was $249,000 for the surgery and $99,000 for the rehabilitation therapy. Notice all the various positions this table can create using electronic hydraulics, tilting pads and elevation. This table - the most advanced of its kind - now uses vibration technology, along with angular traction, to specifically match the patient's needs.